Christopher Nolan is an exceptionally divisive cinematic figure. But before The Dark Knight Rises (2012) and Interstellar (2014) split opinion of him, he was beloved. And perhaps no film was more responsible for his adulation by cinephiles than the non-linear murder mystery Memento (2000). 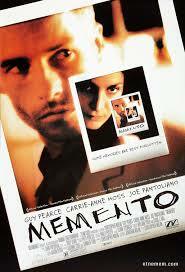 At its simplest level, Memento is the story of Leonard, a man trying to solve the mystery of who killed his wife. The film is perhaps most famous for the manner in which its non-linear narrative literally unfolds. Leonard, who has amnesia, slowly pieces together what happened to his beloved and records the memories he needs to hold on to in tattoos. This structure, along with the performances, are the chief joys of the film. One issue for me is that both the structure of the film, and the establishment of Leonard as a character, means the success or otherwise of the film is predicated totally on the twist that is obviously coming. In the end it fell slightly flat for me, perhaps because I had seen similar before (though admittedly, they may have been made after this film). Having said that though, whilst the main twist has been seen plenty of times before, there is plenty of embellishment around that which satisfies here. Coming relatively close to L.A. Confidential (1997), Memento represents the golden age of Guy Pearce as a Hollywood leading man. He continues to ply his craft in a range of really good supporting roles, but in terms of carrying a film, he is seemingly not held in the same regard these days. Here, Pearce conveys a man obsessed with routine and structure, two things he considers to be his salvation from the existential weight of his condition. Along with the excellent Carrie-Anne Moss, Pearce also brings a strong emotional core to his character which drives the narrative along and pushes it in different directions. I always like it when a film approaches a genre in a totally different way. Memento is a police procedural encased in a structure you would more associate with sci-fi. It’s a combo that works really well, even making the tired Groundhog Day (1993) style structure feel ingenious. Nolan chooses to start the film with the central mystery (seemingly) being solved and unfolding back from there, which to any fan of crime fiction, immediately invokes our favourite reveals at the end of crime stories. But the director toys with those expectations throughout, always a step or two ahead of us. Related beermovie.net articles for you to check out: House of Caine: The Dark Knight and The Rover. Nice read. It’s a shame Pearce hasn’t had too many leading roles of late, he’s a vastly underrated actor. Agree totally. He is really underrated. He was in The Rover, an Aussie film I loved but plenty hated last year. But aside from that, it’s been tough to spot him in anything. I have to say I love this one. The on-its-head narrative and the great performance from Guy Pearce really hit the mark for me. Pearce is such a great actor and it’s a shame he doesn’t get the recognition I think he deserves. Thanks for commenting Keith. Yep, even though I probably like rather than love the film, I similarly loved the narrative structure and Pearce’s performance. This is actually one of my favourite films and still Nolan’s best in my eyes. I have to say, I loved the ending. I thought it was very fitting for Pearce’s character and made a lot sense in the regards to his motivations. Thanks for commenting Mark. That’s interesting it’s your favourite Nolan film. I am a massive fan of his later works actually. Some of his blockbuster work is truly original I think (which is not to say this film isn’t). Sage like words. I’m often intimidated by reviewing films (I’ve had notes on Citizen Kane lying around for ages but still haven’t written anything). But I think that once you start writing, you always find an interesting perspective on something. Wise words, i’m inspired now but it will still have to wait!